As a lot of you know, I have bought an English Bulldog named which I named Jin. He is super cute and cuddly but he also smells esp since he cannot take a bath until this Sat. My sis has been complaining that our house smells like Jin and as much as I do not want to mind, I just can't ignore it. 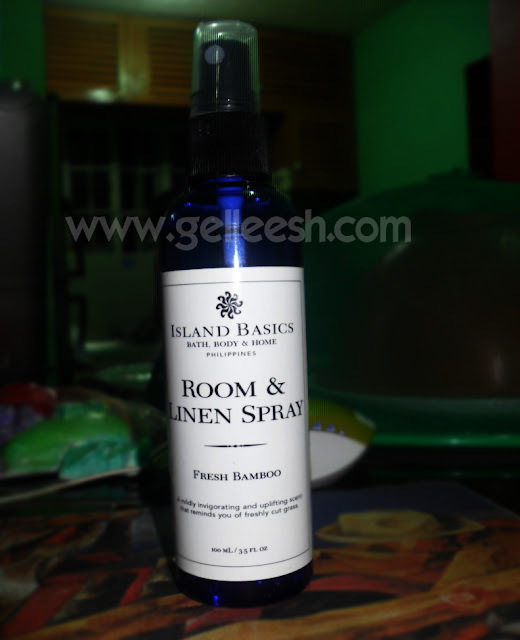 Last week, I bought the Island Basics Room & Linen Spray in Fresh Bamboo. I remember giving a mini version of this to my mom last Christmas. Initially, I used this at Jin's cage (I still keep him in a cage until he grows a bit more so he'd be easier to monitor. Our house got tons of wires. He might go bitin' them) when he pooped one time in it. Ewww. IKR! I'm glad that he isn't pooping peeing in his cage anymore. He waits until I let him out na so we can have his walk too by then. Anyway, this is about the product and not about Jin. Hahaha! First of all, it's organic. Tons of good points in that one already. I remember Ms Marga telling me that her mom used this as a body spray because she loves the scent. It's organic so she didn't have any worries. The scent I got is the Fresh Bamboo scent. According to Island Basics, this scent is for a tranquil mind and body. You see, their Room & Linen sprays have their own uses. Other scents include Lavender (Calm the spirit and soothes the senses), Eucalyptus Mint (Ease your breathing and give relief from colds) and Sunflower Grapes (Energize and refresh the senses). All of them cost only P140 and comes in a 100mL bottle. The fresh bamboo scent is actually perfect for my taste. It doesn't have a strong scent and it is how I love my room to really smell like. It will give you a relaxing feeling and it just makes me want to fall asleep. Hahaha! I'm actually glad that they come in different scents so that it will really suit your needs and personality. I have nothing against this product. I love it and would definitely be buying again. But come to think of it, maybe they could add the ingredients in the label? Aside from that, I'm totally in love with the product and the scent. Again, I love the product and I plan on buying again once it runs out. Island Basics also offer Room & Linen Sprays in 150mL. However, the scents are different. For P200, you can avail of the 150mL scents which comes in Green Tea & Patchouli, Pink Pomelo & Ginger and Basil & Bergamot. I'm giving this product a rating of 10/10. A Room & Linen Spray I love and is affordable too. I totally recommend this. Try the other scents and tell me what you think. Wow it's great to own a product that you love 100% :) Great review! Must try this next. I love home fragrance stuff. The last one I tried was by echostore, grapefruit scent. Now I'm into thebodyshop's fragrance oils. loved the packaging, not artsy fartsy and looks really decent. I love island basic linen spray, they really smells good.